This post contains affiliate links, which means I receive a small commission if you make a purchase through any of these links. It's taken us a long time but we are proud to announce that we are now Zazzle ProDesigners, so we thought we'd better celebrate! And what better way to celebrate than with our new St Patrick's Day design! Mum had originally wanted to create a card with this design, but now she's also added it to a few other products at our CatGoddessDesigns store. We're sure most of you have heard of Zazzle already. It's a very popular online marketplace that lets you publish your designs onto products for free. You can then sell them or just create your own gifts for the people you love. There are hundreds of products to add your art and designs on, but we think it's best to choose a few and not have your design on everything. Another good thing about it is that as a seller you can set your own royalty rates and you can also earn some money by becoming an associate. And Zazzle is not just for designers, photographers and artists. Anyone can have a go, and it's easy once you know how. If you follow the free guidelines and tutorials you'll be an expert in no time. There are some lucky people making quite a bit of money, some even earning a full-time income. And then there's sellers like us, who only earn a small amount every now and then, so no chance of giving up the day job yet! I suppose it's like that for most, though. For Mum, it's been a slow process. It can take a while to earn that first $100 that qualifies you as a ProDesigner at Basic level but she's happy to have reached this status so far. She says she enjoys designing cat-themed products and that's the main thing. It's also enabled her to create lovely personalised gifts for family and friends, so it's not all about making money. For this week's Caturday Art we thought we'd share some fab St Patrick's Day designs that we found on Zazzle. The links are from Zazzle.com, but many of these products are also available at international stores too. WOW, love your designed header. It's awesome. You are quite talented sweetie. So much wonderful art! Zazzle looks like a very cool marketplace! Congratulations! Getting the Pro designation is a big achievement! 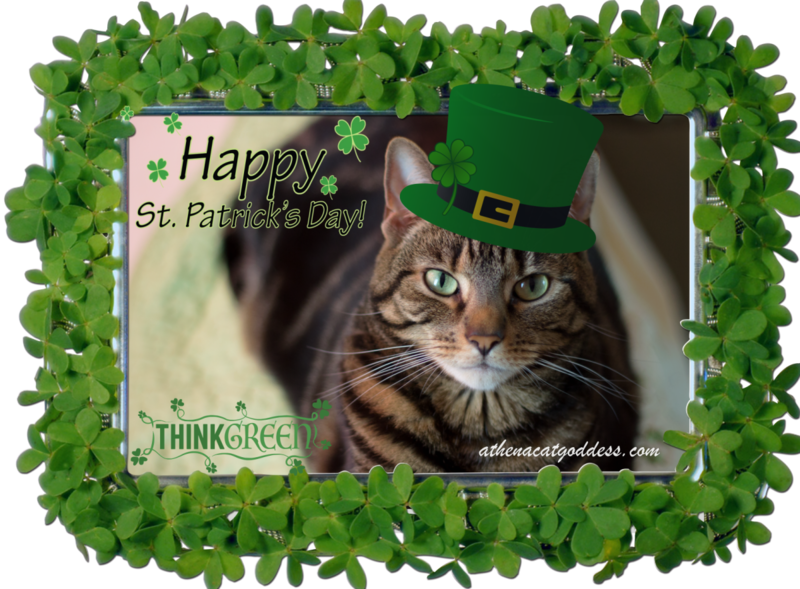 We love your festive Irish look, Athena! We always enjoy seeing your lovely creations. And of course a huge congratulations on being a ProDesigner! We'll certainly be checking out your newest creations on Zazzle. Thanks, Summer. I've seen your designs too and they are amazing! Concatulations you pro you! We loved all the designs you shared too! You have made lots of cute and clever things. We use Zazzle to make calendars every year. Scylla is the Centerfold for March. Congrats on going pro!! I haven't really heard a lot about Zazzle, I'll go check it out! I love your St. Patrick's Day design, and congratulations on becoming a ProDesigner! I just opened a Zazzle store this week and hope eventually to do like you--make a little money here and there. You are definitely ready for St. Patrick's Day! Great piece of art, Athena! A very big concats Athena! I hope you do really well with Zazzle! Great artwork for St Patty's day!!! Cool stuff!! Good luck with Zazzle!! Concats! We love that mug! I've always wanted a Zazzle shop but TW says it's too much work for too little dinero. We love Sweden too! Beautiful country. I think it's the best of those kind of market places, and I've tried a few. That's great.Looking forward to seeing your designs! 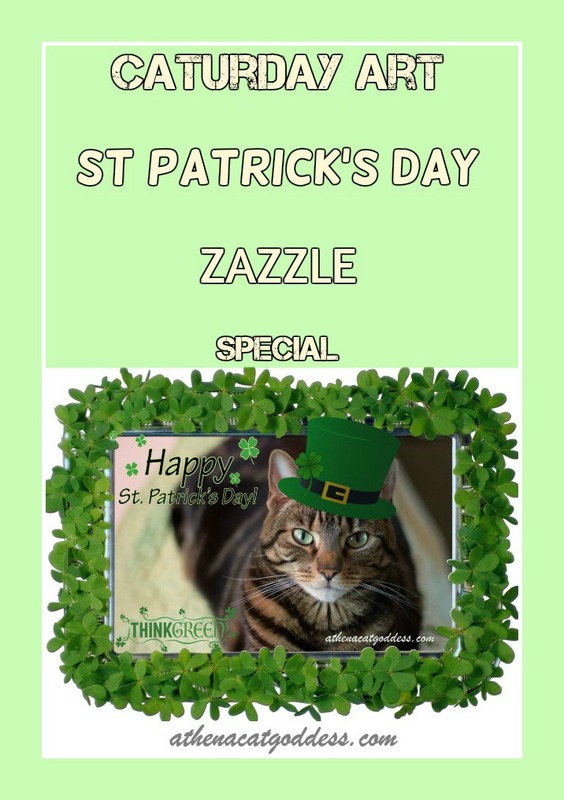 Love your St Patrick's Day design! I've definitely heard of Zazzle but never really looked into it. Now I know more about it, thank you! Congrats on the ProDesigner status.